Kingfisher 1941: The Kingfisher on patrol during World War II. Faced with no other option, the Lincoln County Historical Society commissioned the Port of Toledo Boatyard to demolish the historic wooden charter vessel, Tradewinds Kingfisher. The 50ft National Historic Register vessel, long associated with Depoe Bay, was in an advanced stage of deterioration and posed a potential environmental hazard should it sink. During the demolition process it was discovered the deterioration of the boat was even worse than imagined. Prior to demolition the exterior of the boat was scanned using 3D laser technology. The laser scan produced a very exact electronic record to be utilized by future researchers, model builders, and boat builders. The scan was so exact it was discovered the hull had actually twisted to one side, perhaps from a collision in its past, or with deterioration. Kingfisher 3-D Scan: Every half inch of the exterior of the Kingfisher was scanned by Global Inspection Services of Portland to document the shape of the boat. From the scan data, design drawings or a 3-D drawing or model can be produced. The Tradewinds Kingfisher was built in 1941 by Westerlund Boat and Machine Works of Jantzen Beach, Oregon. Just months after the Kingfisher owner and skipper, Stan Allyn (1913-1992) took possession of the Kingfisher the US entered World War II. Allyn offered his new boat up for wartime use. The Kingfisher served as a boarding and patrol craft from Astoria to Coos Bay on the lookout for a possible enemy invasion. 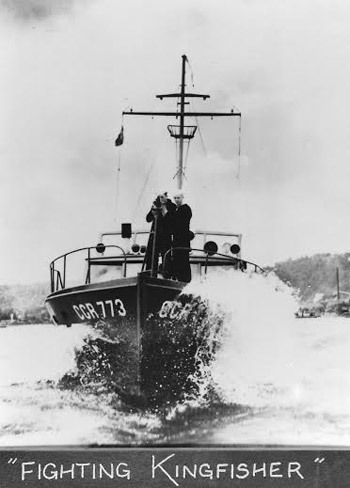 At wars end, the Kingfisher returned to Depoe Bay to serve as Allyn’s flagship charter boat. Many charter boats built in the 1950s copied the Kingfisher’s then innovative styling. The Kingfisher was placed on the National Historic Register in 1991 and retired from service in 2000. In 2001 the Historical Society accepted the Kingfisher as a donation, and went to work trying to drum up essential public support that would enable the organization to properly curate the boat. The Society’s long-term goals for the Kingfisher included offering Yaquina Bay tours aboard the historic vessel. Properly caring for the Kingfisher required an annual investment of approximately $15,000, far exceeding the Historical Society’s annual budget for curating all other 40,000-plus objects in its collection. Moorage fees alone are $395 per month. A shipwright’s survey in 2012 concluded the Kingfisher needed over $70,000 in renovations and repairs. To date the Historical Society has invested over $54,000 in the Kingfisher. Donations from a small, dedicated group of individuals and businesses of time and materials total an estimated $81,000. Past publicity efforts aimed at generating awareness of the Kingfisher’s plight received virtually no public response. Without demonstrated public support grants were not possible. The Historical Society offered the vessel to other museums including the Smithsonian and the Center for Wooden Boats in Seattle and others, all of whom turned the Kingfisher down. A few individuals came forward wanting to assume ownership of the Kingfisher and save her, but were unable to rally the needed support. Nationwide, a growing number of aging wooden boats are being scuttled. For the Society and a small band of Kingfisher aficionados, it was not unlike pulling the plug on a terminally ill family member. The Board of Directors of the Lincoln County Historical Society voted unanimously to dismantle the Kingfisher. An extended article on the history of the Kingfisher appears in the Society’s best selling book The Bayfront. The Society, in conjunction with the Allyn family, is planning an exhibit on the Kingfisher at the Pacific Maritime & Heritage Center that will incorporate pieces salvaged from the boat and possibly the computer laser scans. 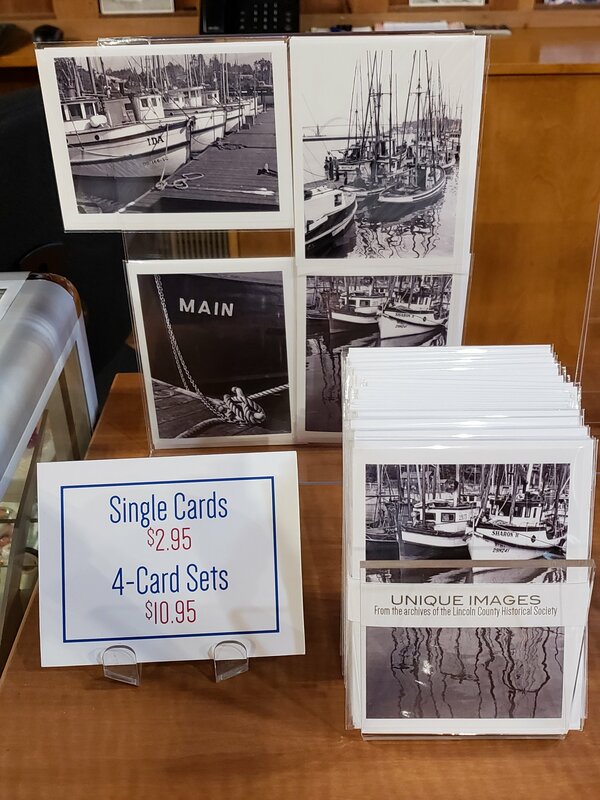 The Historical Society also has in its archive collection papers and records from Stan Allyn, the designer and longtime owner/operator of the Kingfisher.